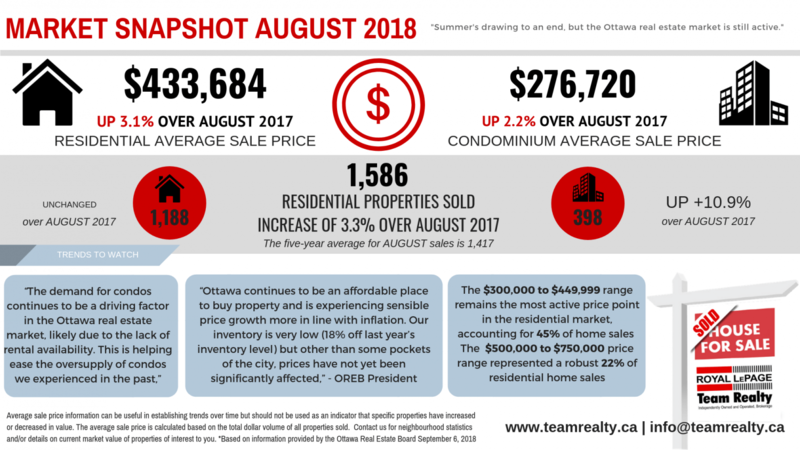 Ottawa Real Estate Board member sold 1,586 residential properties in August 2018, compared with 1,535 in August 2017, an increase of 3.3 per cent. The five-year average for August sales is 1,417. August’s sales included 1,188 in the residential property class, relatively unchanged from a year ago, and 398 in the condominium property class, an increase of 10.9 percent from August 2017. “Our real estate market has had a busier than usual summer season, and we are shaping up for a busy fall period as well,” affirms Ottawa Real Estate Board President Ralph Shaw. “An active market is likely to be the new normal for the foreseeable future,” he speculates. $300,000 to $449,999 accounting for 45% of Ottawa Real Estate Board’s home sales. Between $175,000 to $274,999 was August’s most active price point in the condominium market, accounting for almost 56% of the units sold.